What Else We Can Book For You? We have been working with Celtic Group Hostels for many years, the team is very efficient and reactive. Our collaboration has always been fully satisfactory ! Teacher at Skals Efterskole, Denmark. 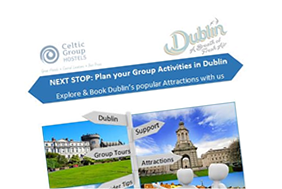 I highly recommend Celtic Group as Travel Agency for Schools. Every request we had about hostel, food, transportation and activities was fulfilled. The support from the team working at Celtic Group is brilliant both before and during the trip. This is just to say thank you for everything you organized for us. We had a fantastic time in Dublin. The students said the trip to Wicklow mountains was an absolute highlight. Our busdriver/guide was great and it was good planning that we arrived early in Glendalough so that we could go hiking along the Upper Lake. Again thanks a lot and hopefully there will be a next time!